Despite gains in EHR adoption (nationwide rates recently passed 75 percent for office-based physicians), small practices, particularly those of five providers or less, lag behind the rest of the nation. EHR adoption rates for these practices hovered around 50 percent in 2012. Resources are the obvious obstacle. 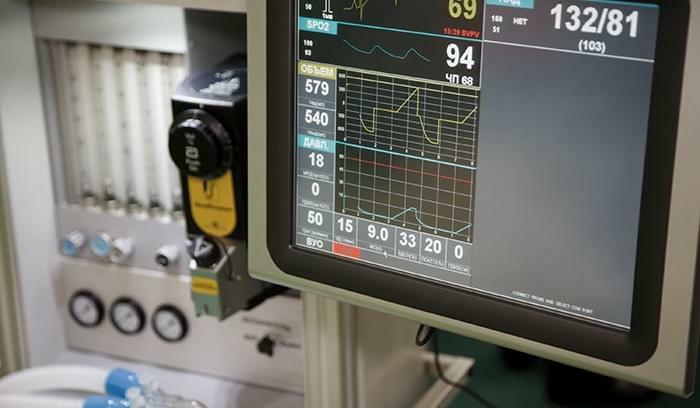 Many first generation EHR systems required physicians to create a dedicated hosting infrastructure, a significant capital investment that includes multiple hardware purchases in addition to the EHR software license. Even with Meaningful Use incentives, the total cost of ownership for such a system was often more than small and medium sized practices were willing to invest. However, in the last few years the market has shifted. More EHRs are now geared toward the needs of small and medium sized practices, particularly in the implementation phase. 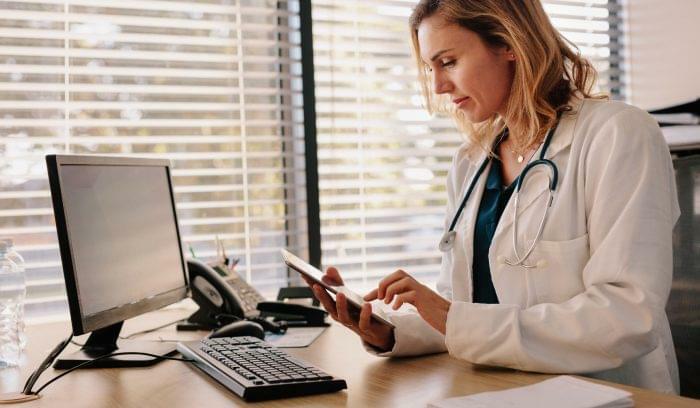 Instead of requiring physicians to build their own hosting infrastructure, many vendors now offer cloud-based products that physicians can easily access through the web, across devices. But even with the increased number of cloud-based EHRs, small practices must still exercise caution when choosing a product. When the HITECH Act passed in 2009, the EHR market was flooded with options, many of which didn’t offer the required functionality to meet Meaningful Use, or at least made it difficult to do so. The usability of many EHRs remains in question as well, leaving a significant portion of the physician community disgruntled toward the concept of electronic medical records in general. 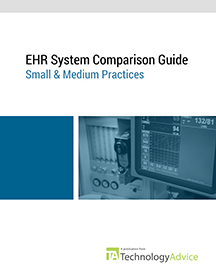 EHR systems have improved in recent years, and this guide showcases some of the best options for small practices in terms of usability, functionality, and price. All of these products are ONC-ATB certified, and can meet Meaningful Use Criteria. You can download the full guide below to see a list of each products features and further abilities, including patient portal integration. The functionality score signifies the power of the system, e.g., its number of features relative to the others on this list, and in the general EHR market. The full guide, available for free at the end of this article, contains a table comparing the functionality of these four systems based on a common set of features. Amazing Charts has consistently shown up in top EHR ranking reports by Medscape, Black Book, KLAS, and American EHR partners. This EHR actually placed first in three Black Book Rankings categories in 2013: Client Relationship and Cultural Fit, Deployment and Implementation, and Marginal Value Adds. Amazing Charts meets a number of small practice needs. Not only is the solution affordable, but providers can download a free trial and take the software for a test run before deciding whether to purchase it. This system foregoes most design and focuses on simplicity. It has the necessary charting functions, e-prescribing, templates, and document management capabilities that providers need. Where the system really shines is in its usability. Though EHRs are undoubtedly better methods for storing data than paper records, many systems are notorious for the amount of clicks it takes to input any data. Amazing Charts functions more like a normal operating system or application. Right clicking pulls up a template list and left clicking moves the cursor to the appropriate data input field. While it may seem simplistic, the inclusion of this basic functionality, along with useful tabs in the navigation bar, make Amazing Charts an excellent choice for small practices. Though this EHR doesn’t offer users a flashy design, it’s the availability of information that makes the system more usable than its competitors. 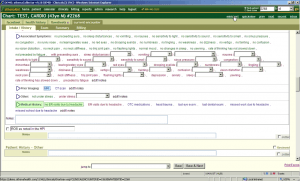 The ability to input information into multiple fields without having to click through multiple windows seems like an obvious element of good design, but is unfortunately all too rare in the electronic medical record field. This makes it all the more impressive that Amazing Charts is able to easily display all the information providers need to update a patient’s chart in the same manner they would with paper charts. But while this product is a very usable system, it doesn’t offer all of the features of more complex systems such as clinical decision support, or an ICD-10 bridge that makes coding recommendations based off ICD-9 codes. That’s not to say that this platform won’t support ICD-10; the new code set will be available at the beginning of 2015 for Amazing Chart customers. This software also won’t run on Mac OS, which could be a limitation depending on your practice’s choice of computers. To make up for its lack of practice management functions, Amazing Charts integrates with a number of billing services as well as EZ Claims, Medisoft, Lytec, and other practice management products. To summarize, this software is incredibly usable and affordable, though more robust solutions exist. Perfect for a solo or small practice looking to implement a simple EHR. 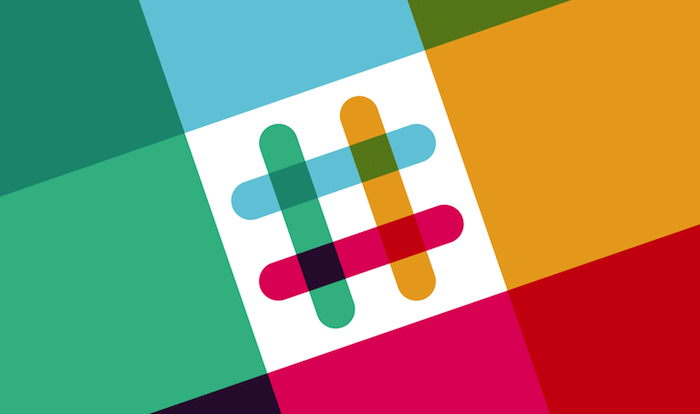 Pricing: $2, 295 per license w/ Support and Maintenance. $1200 per license without Support. In contrast to the core functionality approach of Amazing Charts, athenaClinicals by athenahealth may be one of the most comprehensive electronic medical records products on the market. But athena hasn’t sacrificed usability to make a complex EHR. 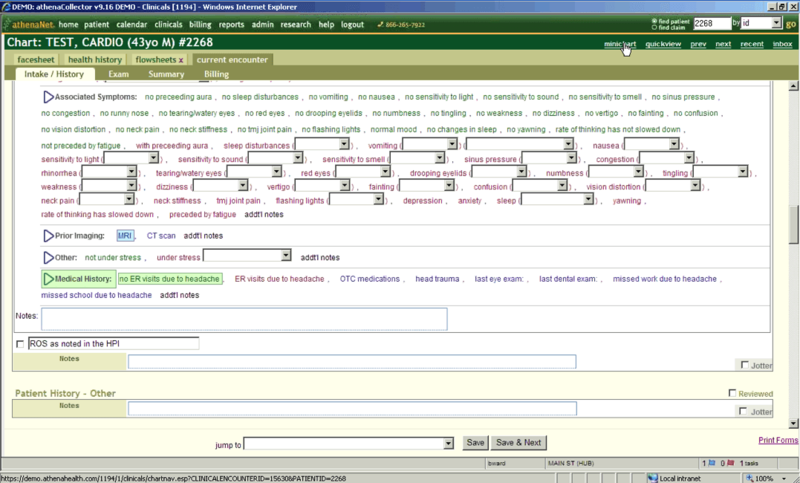 Quite the opposite in fact – this EHR actually placed first for usability in KLAS’s 2012 survey. Due to the sheer number of features in this platform, it’s difficult to walk through the entirety of the product within the scope of this guide, so we’ll focus on the most unique features of athenaClinicals. As a cloud-based platform, athenaClinicals keeps all their client information on one network, which allows them to offer powerful support through the system’s rules engine. 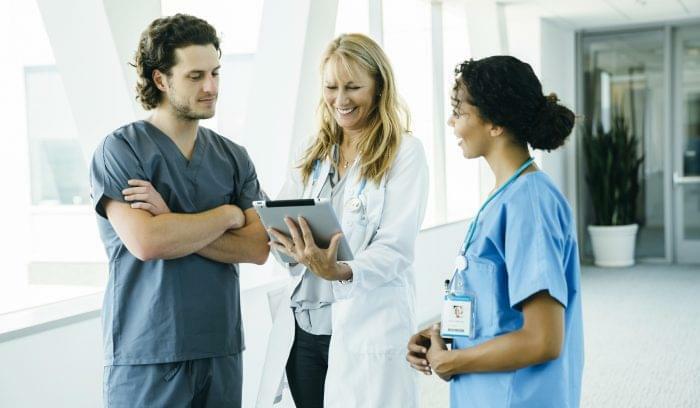 Often used for clinical decision support – which this product also does – athena’s rules engine connects providers to updated clinical guidelines, protocols, and pay-for-performance best practices. For example, athena’s staff constantly monitor reimbursement trends within their provider network, so if a particular type of coding error or payer denial becomes a trend, athena’s staff updates the system’s rules engine to automatically correct the problem across all of their providers’ systems. In this way, all athenaClinicals customers benefit from the data that the company is collecting, instead of just the vendor. 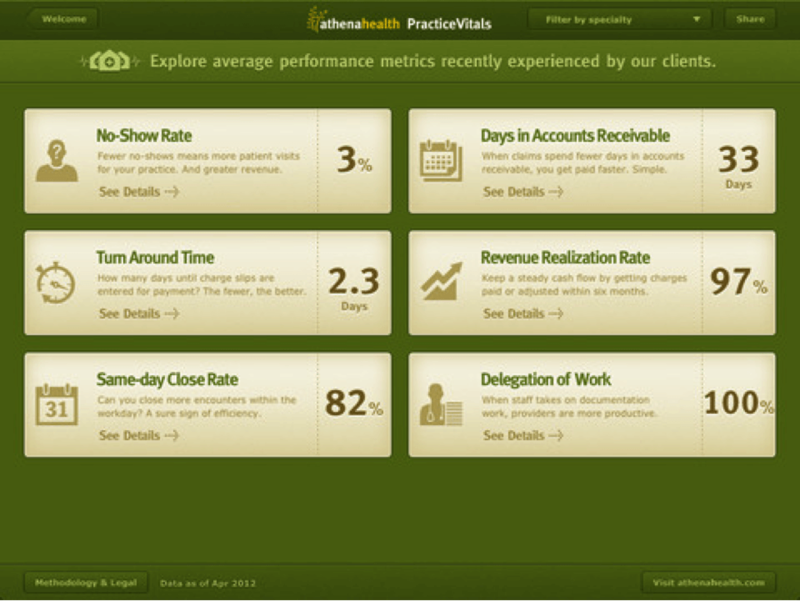 AthenaClinicals also offers a dedicated Meaningful Use dashboard, which helps providers track their progress in qualifying for incentives, not to mention the progress of all athenaClinicals providers. 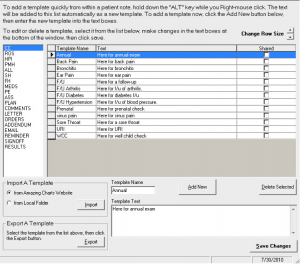 This dashboard arrangement is quite effective, and athenaClinicals was voted the best EHR for helping providers achieve Meaningful Use, in the previously mentioned KLAS survey. Athena also offers providers extensive customer service support, both for trouble shooting and back office tasks. Providers can automate their faxing and data entry by routing faxes directly to athena, whose staff will enter the data into the provider’s EHR, thereby freeing up office staff to focus on important tasks such as patient care. This EHR vendor also has an excellent reputation for training, and a video library is provided inside the EHR so physicians can quickly reference information and walkthroughs. Athena isn’t perfect though. Despite the company’s focus on usability, some providers complain that entering data still requires too many clicks and drop down menus when simply typing the information would suffice. Here’s a look at a (test) patient’s chart that may shed some insight into the complaints. To summarize, athena is an innovative company, and athenaClinicals is both powerful, customizable, and for the most part usable. The organization also offers some of the best customer service in the industry to complement its extensive platform. A prime example of the new wave of cloud-based EHR products, MediTouch focuses on making complex processes simple for the user. MediTouch supports Mac users through Safari, and was actually designed to be used with an iPad. This development strategy will appeal to physicians who prefer to use a tablet to enter data at the point of care, rather than a laptop or desktop. MediTouch’s tablet-focused strategy is an interesting one, and answers one of the main complaints physicians have about EHRs, specifically that it takes too much time to enter data at the point of care. Physicians have been so unhappy with data entry that they often hire scribes to enter data into the EHR while they attend to the patient. Using a tablet is a cheaper alternative to hiring a scribe because the technology allows the physician to enter data into the patient’s chart while still facing and interacting with them. 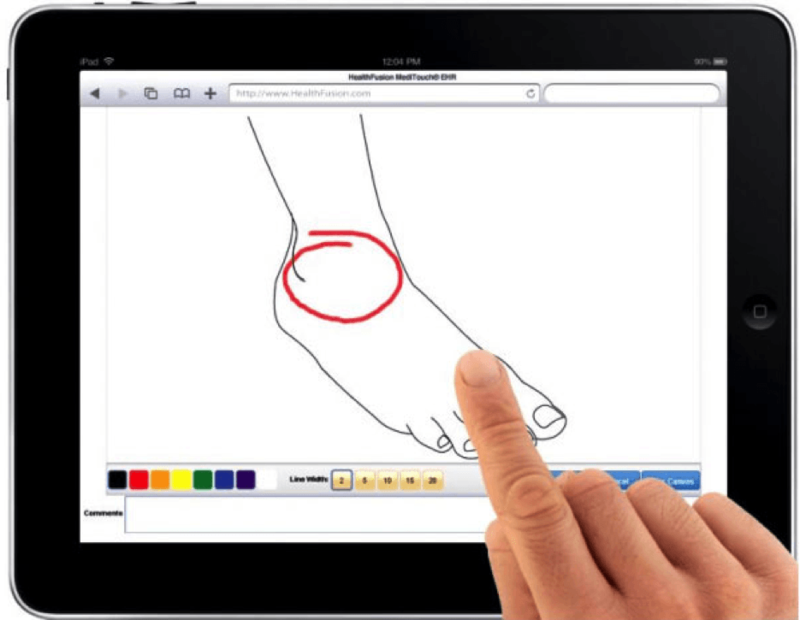 Utilizing a system like MediTouch can be particularly useful for diagnosing patients, as the system allows physicians to simply draw on an anatomical figure to represent different planes of the body or anatomical directions, such as distal or proximal. 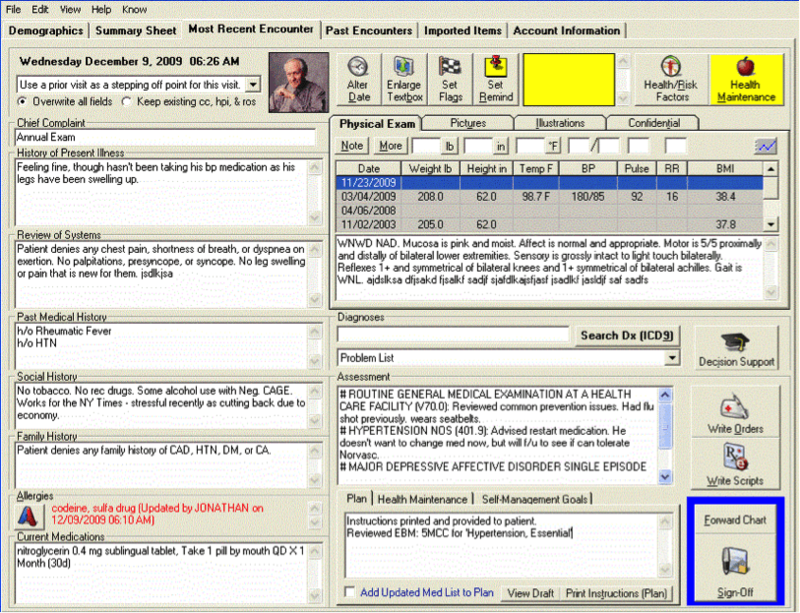 While its iPad functionality may be MediTouch’s most unique feature, this EHR also functions well in other areas. 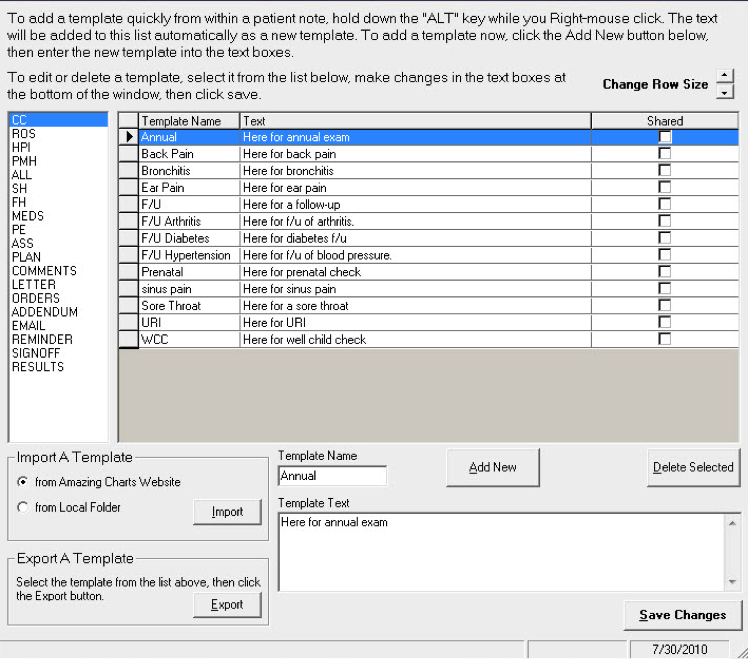 Customizable workflows and diagnosis templates help physicians mold the EHR to their workflow, and a strong revenue cycle management feature helps physicians intake data during the patient visit, automate charging through template use, optimize codes for reduced denials, and auto-post using electronic remittance advice when necessary. MediTouch also features an ICD-10 bridge, which helps providers prepare for the 2015 transition to the new code set. By typing in ICD-9 codes, MediTouch will return parallel ICD-10 codes, eliminating at least some of the need for expensive training. 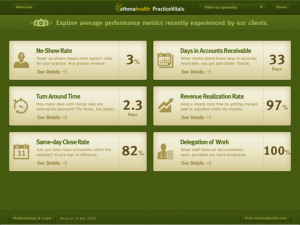 Overall, MediTouch is a user-friendly EHR, and with typically high physician satisfaction rates. This platform can be deployed as a standalone EHR or in conjunction with Healthfusion’s practice management system, and an outsourced billing option is also available. Of course, these aren’t the only options available to small practices. The EHR market is huge and numerous other products could fit the needs of your practice. For more information on the specific features of each software, you can download our full report below or reach one of our dedicated software advisers at 877-720-3289. You can also view our full electronic health record listings.